Political/social sensitivity of the activities financed from that fund. Impact or potential impact of that fund on other programs or services. Significance of that fund on financing activities which are of high interest to public. Existence of known uses or users of that information (e.g., bond rating companies, investors, etc.). Relative size (without regard to the GASB Statement 34 limits). Year-to-year consistency in reporting, etc. 4.3.2.20 The general (current expense) fund is always reported as a major fund. Major funds reporting only applies to governmental and enterprise funds. It does not apply to internal service or fiduciary funds. The determination of which funds are major must be made each fiscal year. The same element that met the above ten percent intention is at least five percent of the corresponding element total for all governmental and enterprise funds combined. They have to meet both of the criteria above to be required to be reported as a major fund. No elimination of interfund balances is necessary in order to apply the criteria unless there are some significant amounts of interfund payables and receivables, then those can be netted. Total revenues means all revenues - both operating and nonoperating revenues of enterprise funds, including capital contributions except for other financing sources (governmental funds), transfers in and gains from the extraordinary items. Total expenditures/expenses means all expenditures or expenses – both operating and nonoperating except for other financing uses (governmental funds), transfers out and losses from the extraordinary items. The test should be applied to the GAAP amounts reported in the funds financial statements. 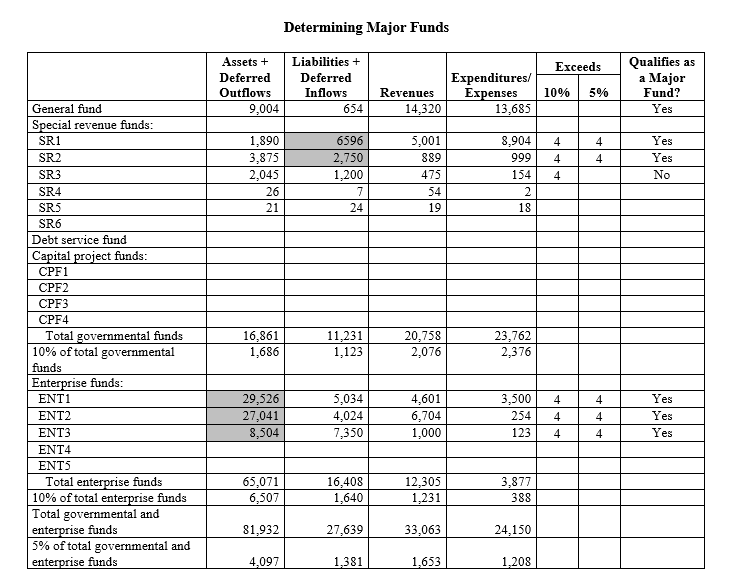 4.3.2.50 If there are no major enterprise funds, they all should be reported in one column and the second column would show the internal service fund(s). For more details see Proprietary Funds Financial Statements. 4.3.2.60 Internal service funds are reported in a single column on the face of the proprietary fund financial statements to the right of the enterprise funds. For more details see Internal Service Funds. 4.3.2.70 Fiduciary funds are to be reported in the fund financial statements by fund type (e.g., pension, investment trust, private purpose, and custodial funds). For more details see Fiduciary Funds Financial Statements. 4.3.2.80 Nonmajor funds should be aggregated and reported in a single column to the right of the major funds in the financial statements. It is not permitted to use more than one column for nonmajor funds. Interfund transactions and balances may be, but are not required to be, eliminated when nonmajor funds are combined. Combining statements for the nonmajor funds are not required, but may be presented as supplementary information. These amounts apply for the year being reported. Do not use prior year data. “. . . all funds of that category” means all governmental funds, including the general fund. “. . . all funds of that type” means all enterprise funds.